Tech Support Self Help - How do I subscribe to a calendar? Select a calendar to view on the Campus Calendar Homepage. The Calendar Display page opens. It does have to be the display page for any of the calendars to which you are susbscribing. Click the Subscribe icon . The Subscription page opens. Select the calendar or calendars (CTRL-click to select multiple calendars) to which you are subscribing, and then click the Add button to move them to the Selected Calendars list. 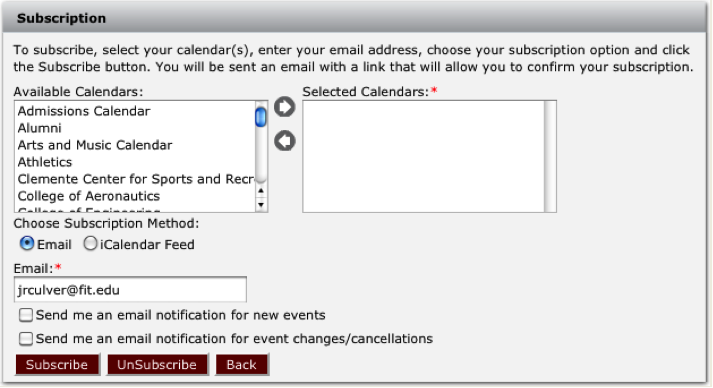 Choose your subscription method: Email (default value) or iCalendar feed. Email- to receive a confirmation email that contains a link that you must click to activate or edit your susbscription. If you select this option, go to To subscribe using email. iCalendar feed- to automatically add the selected calendars to your email program and subscribe to updates to the calendar. If you select this option, the Email field and email options are removed from the page. Go to To subscribe using an iCalendar feed. A dialog box opens asking you if you want to allow this website to open a program on your computer. A dialog box opens asking you if you want to add this Internet Calendar to your email program (in this example, Microsoft Outlook) and subscribe to updates. 3. Optionally, click Advanced to open a Subscriptions dialog box and customize the settings for your subscription on your email program. 4. Click Yes to add the calendar or calendars to your email program. Any further problems, please contact tech Support through email at techsupport@fit.edu or call at (321)674-7284. For questions on viewing, filtering, and manageing calendars, please review the FAQ's on the Master Calendar category.